At a recent Acer press event in Beijing Acer has unveiled a new Android-based tablet that looks two parts iPad and one part Kindle. With a seven inch screen and rather recognisable large black bezel, the new device will be running Android with a specially-created overlay. 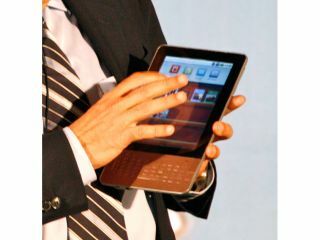 The new tablet is apparently designed for many of the same things as the iPad, namely books, music, internet and email. Acer CEO Gianfranco Lanci said the new tablet device, which also sports a full QWERTY keyboard, will be coming around Q4, which he admitted means 'probably September or October'... despite the latter being in Q3. While admitting that the new and unnamed tablet device does bear a resemblance to Apple's iPad, Lanci hinted that he thought the iPad's screen was too big. "We are not convinced that 10 inches is the right size for this type of device," he told APC. "It becomes too close to a netbook in size, and why should it not be a netbook with full PC capability?"